When I first heard about the Selma-to-Montgomery March anniversary, I knew tiny Selma wouldn’t be prepared for the onslaught of 80 thousand people so I didn’t delay searching online for a suitable hotel room. Along with the other 79,999 folks doing the same thing. What I found was a room at the Bates Selma Motel for $52 a night. They had 4 rooms left the day I made my online reservation a month ahead, and I wondered why THEY did when it seemed NO ONE else did. My brother worked there throughout high school, so I remembered the place and knew it was going to be very, shall we say, BASIC, but I was happy to find it. I only made the reservation for one night though, thinking that if it was awful, I wouldn’t be committed to two nights. I was flying by the seat of my pants in thinking I’d find a place for the second night so RJ and I took our sleeping bags and pillows in case we had to sleep under the stars. Because this sweet representative of a company that does bad business WAS so sweet, and because I let her know I didn’t hold her personally responsible, we were able to really ‘connect’ during our phone conversations. It turns out she has a brother that lives in Alabama, and after I told her all about my trip and the history behind it all, she and her husband are now planning their own trip from their South Dakota home to visit her brother and Selma! (I advised her against making reservations with Wyndham Resorts). 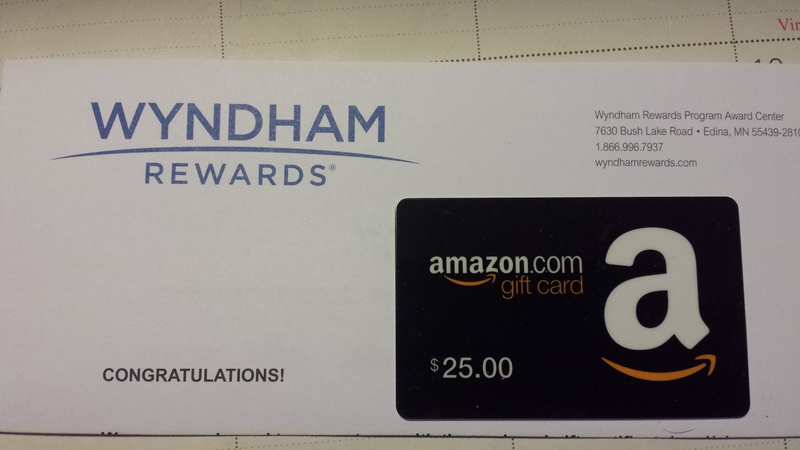 At the end of our conversation, she offered to enroll me in the ‘Wyndham Rewards Program’. I’m sure you’re familiar with similar programs where you earn ‘points’ that you can use for future room discounts or other perks. I declined, telling her I rarely travel so I knew I wouldn’t be able to collect points. Instead, she offered to set up my account with 10,000 points automatically! I agreed, the process was seamless and I then used 6,500 of those points to order a $25 Amazon gift card for Michael’s birthday! The card arrived yesterday, right on time. He was quite pleased because now he can order music or books of his choice, and I’m tickled purple about how all of this turned out. So, the trip and the birthday gift didn’t cost me anything, and I gained a new friend in South Dakota. priceless. What about that second night of no place to stay? Karma was with me on this trip… a friend from my UU church here in NE TN, traveled to Selma with her daughter and was staying at a very nice Hyatt RESORT hotel 90 miles away, in Birmingham. HER hotel stay was being paid for using credit card ‘rewards points’ and since it wasn’t costing her anything, she insisted that we stay with her, at no cost, in their suite. Yeah, it was sweet too. (Thanks Cindi!) A free breakfast came with BOTH hotels, so we loaded up on calories in the mornings, and only had to buy our dinners on Saturday night because of yet another kindness shown to us…on Sunday night after the march, the UU Church in Montgomery invited any and all marchers to their church for dinner and music. The congregants were warm and inviting, the meal was fabulous, the folky/ social justice singing was led by a talented singer/guitarist and all I had to do was follow my friend there from Selma, which was on the way to Birmingham anyway! Have a great, frugal weekend! Girl you can always swing some sweet deals and you sure did on this trip. Plus you two had the experience of a lifetime: all priceless! These memories will stay with you forever. I had almost talked myself out of going after they ‘canceled my reservation’ but I’m really glad I didn’t. It was really neat to feel a part of something bigger than all of us. Wonderful post, and what an experience. 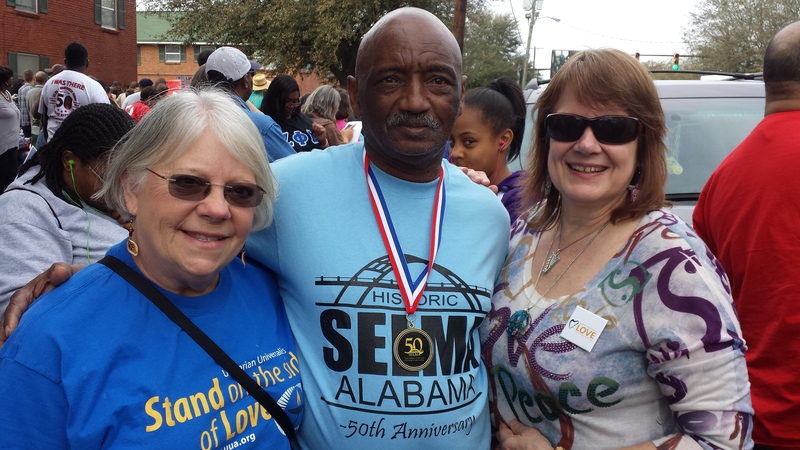 Being in Selma must have been so powerful. As a fellow UU, I must say that my daughter and I found a welcoming service, clean bathroom and snack right before we attended the NYC Climate March at a UU church on Central Park West. UUs are quite a hospitable bunch. Agreed Andrea! Rev. Luck was at that march too!